No, a dental referral is not required. Many patients are referred by their family dentist, but most are referred by family and friends. Simply text, send us an email, or call the office. Dr. Held will be happy to contact you back and schedule your appointment! What will I learn during the initial consultation? Is there an orthodontic concern? If so, what is it? What will Dr. Held do to correct the problem? The American Association of Orthodontists recommends an orthodontic screening by the age of seven, or earlier if a problem is detected by the parents, family dentist, or pediatrician. Typically by this age, several permanent teeth have erupted (i.e., grown in), which allows Dr. Held to evaluate your child’s orthodontic needs effectively. No, they will not. The space available for the front teeth does not increase as you grow. In most people, after the permanent molars grow in, the space available for the front teeth decreases with age. Dr. Held uses both a two-phase treatment approach (when applicable), and The Physiodynamic® System. Both of these treatment modalities greatly reduce the need for extraction of permanent teeth. Phase I Treatment, if necessary, is usually initiated between the ages of seven and ten, and lasts about six to eight months. The primary objective for Phase I Treatment is to address significant problems and prevent them from becoming more severe. These problems may include, but are not limited to: providing more room for permanent teeth to come in, improving a narrow airway, correcting a crossbite, correcting an overbite or underbite, correcting an open bite, improving facial profile and lip posture, and boosting self-esteem and self-image. When jaw discrepancies are present, taking advantage of growth early is the key to achieving an ideal result overall. Leaving such a condition untreated until all permanent teeth come in could result in a jaw discrepancy too severe to achieve an ideal result with braces alone. Will my child need Phase II Treatment (full braces), if he/she had Phase I Treatment? Even with ideal cooperation and favorable growth response in Phase I, most patients will benefit from Phase II Treatment with full braces. However, Phase II is generally less involved and typically entails a shorter treatment time than a full braces case for patients who have never undergone Phase I. Overall results are significantly better for patients who underwent Phase I first, when it was indicated. Is it too late to have braces, if I am already an adult? More and more adults today are seeking the benefits of a beautiful, healthy smile. 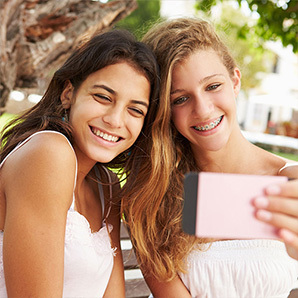 In our practice, a significant number of our orthodontic patients are over the age of 21. The oldest patient Dr. Held has treated was 61 years young. Health, happiness, and self-esteem are vitally important at any age. It’s never too late! Treatment time depends upon each patient’s specific orthodontic needs. A minor correction could take six months, whereas a standard full case could last 18 to 24 months. More involved treatment, such as surgical cases, may take longer. Generally, braces do not “hurt,” but they do feel foreign at first. Typically, it takes from one day to a week to become acclimated to braces. Dr. Held utilizes the latest orthodontic technology: The Physiodynamic System, which straightens teeth with less discomfort. With this newer technology, we do not “tighten” braces anymore, since these braces gently self-activate daily. After certain visits, teeth may be sore for a few days. An over-the-counter pain reliever (such as Ibuprofen) will provide relief. Orthodontic fees depend upon the complexity of the correction and the length of treatment. Dr. Held will explain the exact cost and financial options during the initial consultation. Dr. Held has many financing options available to accommodate your needs, and she will review these options with you. She will also review your insurance information, help to maximize your benefit, and file your claims for you. Appointments are scheduled according to each patient’s needs. Dr. Held uses the latest orthodontic technology, including comfortable, self-activating expanders and the Physiodynamic System, both of which require less frequent visits. Most patients are seen every eight to 12 weeks. Unfortunately, Dr. Held cannot schedule all appointments for students during after school hours. However, because most appointments are scheduled eight to 12 weeks apart, patients will miss minimal school due to their orthodontic treatment. Dr. Held will make a sincere effort to meet your scheduling needs. Can I drop off my son or daughter for an appointment? Yes. Dr. Held understands your busy schedule, and is happy to help you to make the most of your time. On some occasions, Dr. Held may request to speak with a parent when he or she returns, so she asks that parents check in upon their return to the office. Yes, but Dr. Held recommends wearing a mouthguard for all sports. She has special mouthguards for patients to protect their teeth, braces, and jaw joints. Just ask, and she will be happy to fit you with one. Yes! Dr. Held recommends that you see your family dentist at least every six months for a thorough cleaning and examination while undergoing orthodontic treatment. Yes. Once your treatment begins, Dr. Held will provide you with complete diet instructions and a list of foods to avoid. These foods include hard, sticky, chewy, and crunchy items, such as ice, hard candy, nuts, gum, caramel, taffy, granola bars, etc. These items can distort or break your braces. You can avoid extra repair appointments and reduce your time in braces by following these instructions. Excellent oral hygiene is a must with braces. Patients should brush throughly at least three to four times each day: after each meal and before going to bed. Once your treatment begins, Dr. Held will provide a Hygiene Kit to help you to achieve a beautiful, healthy smile. An orthodontist is a specialist in the diagnosis, prevention, and treatment of dental and facial irregularities. All orthodontists are dentists, but only about six percent of dentists are orthodontists. Admission to an orthodontic postgraduate program is extremely competitive and selective. It takes many years to become an orthodontist, and the educational requirements are demanding. He or she must complete college requirements before starting a four-year graduate program at a dental school accredited by the American Dental Association. After dental school, at least two or three academic years of advanced specialty education in an ADA-accredited orthodontic program are required to become an orthodontist. The program includes advanced education in biomedical, behavioral, and basic sciences. An orthodontic student learns the complex skills required to manage tooth movement (orthodontics) and to guide facial development (dentofacial orthopedics).